The first iPhone app I wrote was BigNames - a large-text contact list. It’s also one of the apps that I use the most, so I was surprised to hear that a particular user found that it worked the first time, but then crashed on subsequent loads. The only thing I could think of was that the app was running out of memory and was being killed by the OS. BigNames builds an array of names when it first loads, so that it can load quickly in the future. A huge number of contacts might consume too much memory. This user had around 6700 (!!!) contacts â€“ far more than I had ever tested â€“ but still I would have expected to load hundreds of thousands of strings into an NSArray before hitting the 20-30 MB memory limit. To replicate the problem, I wrote a method to create thousands of bogus contacts. Sure enough, when there were more than 4000 names being loaded from cache, it would crash on load. One odd point, was that that app would only crash when I wasn’t running it in debug mode. This was annoying, since normally I would add NSLog messages or breakpoints to identify and understand a problem, but the app would only crash when these tools were unavailable. 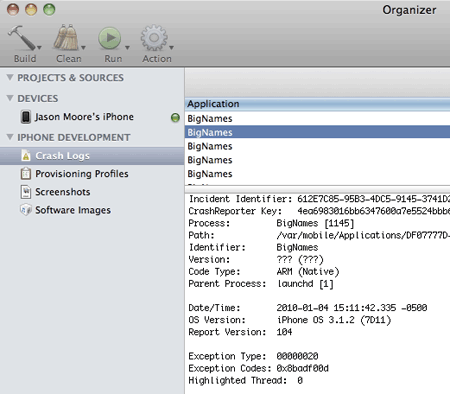 I remembered that Crash Logs are stored on the device and can be viewed with Xcode’s Organizer. I was able to see that the crashes weren’t the normal EXC_BAD_ACCESS variety but was something called 0x8badf00d (ha ha, get it?) and was actually the launchd complaining that the app was “failed to launch in time”. So, we aren’t actually taking about a crash, just a slow to load app. And that explains why this wasn’t happening during a debug session. Debugging is slower than simply running an app, so I assume that launchd skips the timeout check when in debug mode. The “failed to launch in time” error led me to think that I was doing too much work in applicationDidFinishLaunching:. I moved some of the loading of cached names to a separate thread so the app was able to load without getting killed by launchd â€“ but then was unresponsive for the first 10-15 seconds. Not a huge improvement. Only the first few lines are relevant. The last bit of code that I control is loadView, and then it seems to get stuck in some sort of loop creating NSIndexPaths. I thought perhaps the custom table footer was causing problems (lines 5-7), but removing the footer had no effect. I was out of ideas, and the problem seemed to be in Apple’s UITableView code, so I decided I needed to send an email for the Apple developer support. If it was a bug that a UITableView couldn’t handle more than 4000 rows maybe they would have a workaround. There are performance implications to using tableView:heightForRowAtIndexPath: instead of rowHeight. Every time a table view is displayed, it calls tableView:heightForRowAtIndexPath: on the delegate for each of its rows, which can result in a significant performance problem with table views having a large number of rows (approximately 1000 or more).